In today's social-media obsessed world, there are many analytical tools and companies to help you measure your online influence. Klout.com was one of the first on the scene in September 2009, measuring -- on a scale of 1 to 100 -- your online influence on sites like Twitter and Facebook. Since launching, the company added LinkedIn, YouTube, Foursquare and most recently Google + to its algorithm. A company's "klout scores" have been used to target influencers and provide perks ranging from Hollywood studio film premiere tickets to Spotify invites. While Klout has pretty much owned the social-media influence market, some are questioning the reliability of the company's data and "score." Enter, Kred, which is a social-media scoring system that seeks to measure a person's online influence. But Kred, which was created by the San Francisco-based social analytics firm PeopleBrowsr, attempts to also measure a person or company's engagement, or as they call it, outreach. PeopleBrowsr hopes that that combination can offer a more informed metric for non-celebrities like entrepreneurs and those whom they follow and look to for advice. At the Kred launch party last Thursday, I spoke with PeopleBrowsr CEO Jodee Rich about how Kred is upping the ante from data mining to organizing and deconstructing that into influence. 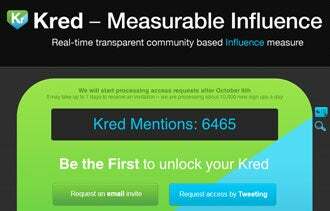 How does Kred measure online influence? Kred has a dual scoring system with separate metrics for "influence" and "outreach." Influence measures your trust and respect among your peers on a 1,000 point scale. Outreach increases by levels and reflects generosity in the form of helping others spread their messages. We think this -- the Kred scoring system -- is strong because it's reflective of the foundations of strong relationships everywhere: trust and generosity. How can someone translate online influence into monetization? It’s really the same benefit as networking in real life: You get an opportunity to meet more people who can help you achieve your business goals, accept that through Kred, you have the advantage of knowing exactly who may be most receptive to you before you engage with them. Increasing opportunities to get a message out to a prequalified crowd is fantastic for both you and your potential customer. What advice do you have for entrepreneurs who want to build online influence? You can use Kred to find people with high influence in the communities where you want to make your mark. Follow them and help them grow their Influence by re-tweeting them and engaging in conversations. If they have a high level of outreach, that demonstrates a propensity to help those who are helping them. Kred also recommends to anyone -- be they brands or individuals -- recommendations on fresh content to introduce to the community. Tweeting the new content will increase your Influence score and create opportunities to reach the most respected people in the community. If the people following you have strong outreach scores, they will probably help you too by passing along your content. In turn, that builds your own influence. Where do you see the future of this industry and how it affects entrepreneurs/brands? Kred is a step towards helping everyone identify influencers, become one themselves and get their message amplified among groups of like-minded people. In a world where people are buffeted by the 10,000 or so tweets posted every second, it’s incredibly difficult to reach the right person at the right time without effective, simple analytical tools to guide them. We think that Kred is just the start for developing a toolset for entrepreneurs and other small firms to compete with their bigger counterparts on an equal footing.